Engineers working on some projects have complained of problems with contractors using inferior concrete or inadequate steel support bars. A report by the state-run magazine Time Weekly reported allegations that builders on another section of the same Wuhan-Yichang line may have compromised safety by substituting soil for rocks in the railway bed. In an interview with Xinhua, Huang Qiang, chief researcher with the China Academy of Railway Sciences, said Beijing is continuing a safety overhaul of high-speed railways that includes development and improvement of signaling equipment, train maintenance and protection against lightning and earthquakes. "China's high-speed railway development has been aggressive in previous years, in which some important links were missed," Xinhua quoted Huang as saying. During February’s annual migration, officials noticed that the high-speed trains were largely empty. But the slow trains on those lines have been taken out of use, giving people few choices. As a result, the highways were clogged and more people rode long-distance buses. Working class travelers complained they couldn't afford high-speed tickets and regular trains were sold out. A migrant worker became an Internet sensation when he stripped to his underwear to protest outside a ticket office after he waited 14 hours in line but couldn't get tickets for his family. In April 2011, China railway ministry also announced it would reduce ticket prices to boost lagging ridership and would slow construction of high-speed lines to avoid outpacing public demand. With the lower ticket prices, it remains to be seen whether the bullet trains will earn money. 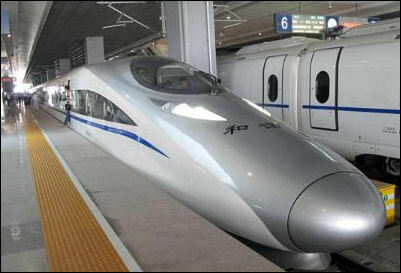 Sun Zhang, a professor with the Urban Rail and Railway Engineering Department of Shanghai's Tongji University, told the Global Times that with concerns rising domestically over passenger numbers and travel costs the government could consider subsidizing the high-speed railway network to make it more affordable to ordinary passengers, particularly in peak traveling seasons such as the Chinese Lunar New Year. “In announcing the safety checks, officials said that in some places, villagers had built pigpens beneath bridges holding high-speed tracks, causing a potential hazard. They also cited concerns about people and dangerous materials being too close to the tracks, increasing the risk of casualties.” In addition to that, “train line construction requires the use of high-quality fly ash in the concrete. Chinese media reported allegations that some contractors might have used lower-quality ash that had been mixed with other substances.” There have been reports that concrete bases for the tracks used cheap, faulty chemical hardening agents, which don’t allow trains to maintain their current high speeds. In June 2011, a former senior official at the ministry accused his ex-boss of covering up operational incidents and of exaggerating the technical capabilities of Chinese-built trains. Zhou Yimin , a retired deputy chief engineer and head of the ministry's science and technology department, told the 21st Century Business Herald that the 300km/h speed limit was necessary because the trains would be inherently unsafe at higher speeds. The rail ministry’s new leaders, brought in after the corruption investigation, contend that safety concerns are misplaced. But they have responded to public anger over fares by announcing plans to lower the top speed on many routes on July 1 “which will not only address safety questions but will sharply reduce the amount of electricity consumed “and pass on the savings through reduced fares. The reports of the accident Friday near Qianjiang city in Hubei province, the latest since a bullet-train crash last summer that killed 40 people, rattled share markets in Hong Kong and Shanghai, where major railway company stocks dropped on the news. China Railway Construction Corp. dropped 6.6 percent, China Railway Group Ltd. fell 5.7 percent to HK$2.82 and China Southern Rail lost 4.4 percent. All are traded in Hong Kong. China has massive resources and considerable prestige invested in its showcase high-speed railways program, and the news appeared to raise sensitivities over the issue. A local government website ran an article denying that any collapse had occurred. An officer who answered the phone Monday in the information office of the China Railway 12th Bureau Group Co., which is in charge of the project, said he had not heard about the collapse and said no other officials were available for comment. The official refused to give his name or title. The huge spending connected with the rail expansion also has been blamed for corruption. In March, the National Audit Office said it had identified 5 billion yuan of financial irregularities in the Beijing-Shanghai link alone. Railways Minister Liu Zhijun was dismissed in the spring of 2011 amid an investigation into unspecified corruption allegations. No details have been released about the allegations against him, but news reports say they include kickbacks, bribes, illegal contracts and sexual liaisons. After Liu's sacking, allegations quickly emerged that he had taken a 2.5 per cent cut on high-speed projects. In February 2011 there were reports that railway minister Liu Zhijun accepted $122 million in kickbacks. Zhang Shuguang, deputy general engineer of the Ministry of Railway and director of its Transportation Department, was suspended on corruption charges . China's state auditor revealed that corruption derived from the Beijing-Shanghai line amounted to $17 million. Many believe that this figure wildly understates the problem. The steep prices for high-speed train tickets have touched China’s raw nerve of rising income inequality. “The government is just abusing the money of the common people,” said one posting on an Internet quoted by the New York Times. In April 2011, the new railways minister, Sheng Guangzu , said he would be putting the brakes not only on the pace of construction’slashing the budget for new rail projects to 2.8 trillion yuan over the period to 2015---but on the actual speed of the trains. It was originally intended that trains on the Beijing-Shanghai route would complete the 1,318-kilometre journey in less than four hours, with trains running at speeds of 350 kilometres per hour or more. 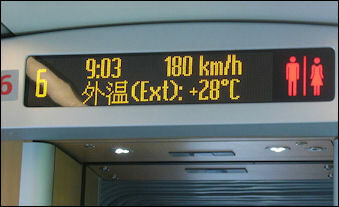 Instead, trains will run at maximum speeds of either 300km/h or 250km/h, adding at least an hour to the trip. Although ministry officials have insisted this is increase energy efficiency and allow for tickets to be more affordable, there have been widespread suggestions it was prompted by safety fears. 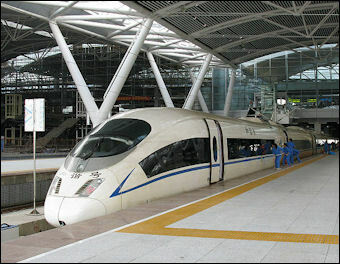 Beijing and Shanghai made their passenger, extending China's high-speed rail network to nearly 10,000 km. Will Clem wrote in the South China Morning Post, “The Beijing-Shanghai rail line has been the subject of a series of controversies since railways minister Liu Zhijun was arrested for corruption in February 2011. Questions about construction quality, embezzlement, inflated claims about the trains' performance, extravagant furnishings for affluent passengers, cost-effectiveness and dithering over the launch date have all taken their toll on what at the close of last year was seen as a national technological success story. Zhou Yimin , a retired deputy chief engineer and head of the ministry's science and technology department, said Siemens warned it could not guarantee safe operations if the trains ran at speeds greater than 300km/h. Zhou's allegations have been dismissed by ministry officials, but the suspicions remain - and his are not the only security concerns that have been raised. According to mainland media reports, thousands of factories have been relocated for fear of debris getting onto the track. “The express was shut down by power failures three times in the two weeks since it opened to great fanfare. Ten days after the train line opened service was halted about 90 minutes following a power failure caused by thunderstorms and heavy winds in Shandong Province. A power failure in Anhui Province a few days later halted 30 trains. The first cut was caused by lightning hitting the overhead line. The next day a train heading from Shanghai to Beijing broke down. This cause of this mishap was unexplained, the China Daily reported, though it could have been linked to poor wiring or improper installation. The two power failures were panned on popular microblogging sites. Passengers complained about being stranded for hours on trains with no air conditioning and with no one telling them what was happening. Railway authorities responded by saying the failures showed that automatic shutdown systems worked well and demonstarted the high safety standards of China’s new trains. The Ministry of Railways has already decided to reduce maximum speed on the line from the promised 350 km per hour (210 mph), to reduce operating costs and in response to a corruption investigation that raised concerns over construction quality. Communist Party mouthpiece the People's Daily warned on Wednesday that the new Beijing-Shanghai line had to up its game. "Just relying on high speed is not enough. We must ask: has there been enough preparation for inclement weather?" it said. "In the event of power cuts and delays, how do you take care of passengers and bear the losses?" China's trains are based on Japanese, French and German technology but its manufacturers are trying to sell to Latin America and the Middle East. That has prompted complaints Beijing is violating the spirit of licenses with foreign providers by reselling technology that was meant to be used only in China. Zhou Yimin , a retired deputy chief engineer and head of China’s railway ministry's science and technology department, said that virtually all key components in the trains were still supplied by overseas firms. "Key equipment was all made by foreign companies such as Siemens," Zhou said. "Though the manufacturing capabilities of the rail industry have improved a lot with the introduction of overseas prototypes in recent years, China's [research and development] remains peripheral...Our trains look almost exactly the same as their peers overseas."